The OTvest, Weighted Vest provides Trunk Stability for Multiple Sclerosis and Other Movement Disorders, Helping Reduce Spasms. Experience the increased stability of wearing the OTvest™. The OTvest™ utilizes effective weight placement that makes a difference. The weighted vest is a simple, non-invasive intervention that can do so much! The OTvest™ denim weighted vest can be used as a gentle intervention and to help naturally treat those who suffer from movement disorders such as multiple sclerosis, as well as other degenerative nervous system or muscular conditions. The deep pressure therapy supplied from the weighted vest provides proprioceptive input to the joint receptors, which in turn send messages to the brain about the body’s position. Proprioceptive input allows us to know, without looking at our arm, that our arm is behind us, next to our body, or up in the air, for example. Because deep pressure helps provide proprioceptive input, weighted vests can, therefore, help improve coordination through the increased awareness of body positioning. This sense of body position, which includes weight, movements of the muscles, tendons, and joints, is called kinesthesia. The OTvest™, with its strategically positioned weights, helps compress the joints and adds sensory stimuli for co-contraction. This allows the OTvest™ to be beneficial for postural stability and increase the wearer’s awareness of where their body is positioned. The added postural stability from the OTvest™ can be used to help naturally treat Parkinson’s, help naturally treat multiple sclerosis, help naturally treat ataxia, and so much more. The OTvest™ adds deep pressure on the shoulder blades (scapula), upper back and upper chest of the wearer. This comfortable, deep pressure therapy can be applied any time of the day to improve trunk stability, giving the wearer better balance, upper extremity function, improved body awareness, and to decrease the tremors that are so often associated with movement disorders. A weighted vest with a revolutionary patented weight insert, the OTvest™ stabilizes the trunk by applying weight to the shoulder-girdle area, helping control balance and distal movement of the arms and hands. The weight across the back puts mild pressure upon the scapula, which encourages the scapula to lie flatter upon the back, improving trunk stability. When the trunk is stabilized, drinking from a cup, combing one's hair, keyboarding, holding a pencil or spoon, and the other activities of daily living, can be more controlled--especially if due to tremors. If you're looking for a natural treatment option for Parkinson's, ataxia, dystonia, or other movement disorders, the deep pressure touch therapy supplied by the OTvest™ weighted vest might be exactly what you need. The occupational therapist, N. VandenBerg, MS, OTR (NDT trained, and Bobath trained by Berta and Karel Bobath) who designed the OTvest™, provided occupational therapy treatment to a three year old with encephalitis and very limited vision, who was unable to pick up a toy because of too much uncontrolled arm movement. When the weighted vest was put on, the young child was able to pick up a toy. The OTvest™, with its trunk stabilizing capabilities, improved distal coordination so much that the child was able to play. By being able to pick up a toy, she was gaining the necessary experience with hand and finger manipulation that she would someday need for self-feeding. 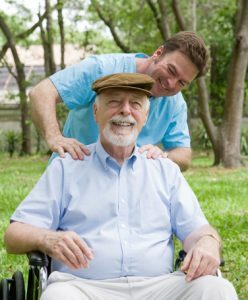 Persons even in their late 90's are seeing improvement when wearing the OTvest™ when it comes to tremor reduction -- allowing them to comb their hair, drink coffee from a mug, and brush their teeth. Research has shown that weight applied in the shoulder area of persons with cerebellar ataxia, including those with multiple sclerosis, improved their lateral (side-to-side) sway when six pounds of weight was applied (Lucy and Hayes, 1985). Another study demonstrated improvement in lateral sway using even less weight (Widener, Allen, Gibson-Horn, 2009). Robin, an OTvest™ wearer with cerebellar ataxia, began wearing the weighted vest in the hopes that it would reduce her lateral sway. 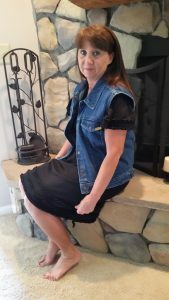 The OTvest™ provided such an effective treatment for cerebellar ataxia in her case that Robin no longer needs to hold onto a wall or depend on support from her physical therapist when she wears the OTvest™. Robin’s before and after experience wearing the weighted vest was recorded and is demonstrated below. In this video, Robin is wearing an OTvest™ size medium with 4lbs of weight. Place an order by clicking here. Look for the yellow "OTvest™" label on the chest pocket to make sure you are getting the genuine OTvest™. Others may look like the OTvest™ from the outside, but the weight placement is important. Only the OTvest™ has the patented weighted insert with weight lying directly upon the body. This makes the difference! Note: The OTvest™ is not recommended for those with spinal cord problems and the accompanying balance problems associated with those disorders, such as herniated or dislocated discs, degenerative disc disease, or other spinal cord injuries. The balance problems that benefit from the OTvest, weighted vest are those with upper motor neuron and/or cerebellar problems described in the first paragraph. Lucy SD, Hayes KC. Postural sway profiles: normal subjects and subjects with cerebellar ataxia. Physiother Can 1985;37: 140-8. Chase RA, Cullen JK, Sullivan SA. Modification of intention tremor in man, Nature 1965;4983:485-7. Clopton N, Schultz D, Boren C, Porter J, Brillhart T. Effects of axial loading on gait for subjects with cerebellar ataxia: preliminary findings. Neurol Report 2003;27:15-21. Hewer RL, Cooper R, Morgan MH. An investigation into the value of treating intention tremor by weighting the affected limb.,Brain 1972;95:570-90. Morgan MH, Hewer RL, Cooper R. Application of an objective method of assessing intention tremor–a further study on the use of weights to reduce intention tremor. J Neurol Neurosurg Psychiatry 1975;38:259-64. Morgan MH. Ataxia and weights, Physiotherapy 1975;61: 332-4. Smedal T, Lydren H, Myhr KM, et al. Balance and gait improved in patients with MS after physiotherapy based on the Bobath concept. Physiother Res Int 2006;11:104-16. Widener GL, Allen DD, Gibson-Horn C. Balance-based torso-weighting may enhance balance in persons with multiple sclerosis: preliminary evidence. Arch Phys Med Rehabil 2009;90:602-9.